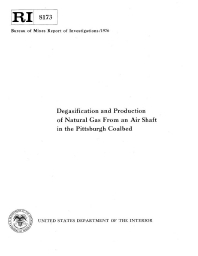 The Bureau of Mines conducted research to determine the effectiveness of long holes drilled in solid virgin coal in degasifying an area of the Pittsburgh coalbed showing that horizontal holes drilled into a virgin coalbed from the bottom of any shaft will effectively remove methane gas in commercial quantities from the Pittsburgh coalbed. The in situ pressure at a depth of 214 feet into the coalbed and the average gas and water flows from the five degasification holes were 3 lb/in2 gage and 860,000 ft3/d and 1.7 Gal/min, respectively. On June 19, 1975, after 593 days of degasification, a compressor was installed and pipeline quality gas was introduced into a commercial pipeline. As of June 1, 1976, after 1,022 days of degasification, over 753 million cubic feet of gas had been drained and 117 million cubic feet of gas had been purchased by the gas company for use in the local community of Wadestown, West Virginia. The gas drained to date is six times the gas estimated to be in the area subtended by the holes. Methane emissions at the working face of 1 west mains, Federal No. 2 Mine has been reduced by 50 pct, proving the value of methane drainage by horizontal degasification holes drilled from shaft bottoms ahead of mining. Directionally Controlled Drilling To Horizontally Intercept Selected Strata, Upper Freeport Coalbed, Greene County, Pa.